King Wen's sequence is ordered into pairs. Each pair is clearly related to the other member of the set; the hexagram is either inverted or rendered as its yin-yang opposite. But the pairs are also presented in a specific order which has, thus far, proven mathematically impenetrable. The King Wen's circular arrangement of the eight trigrams is similarly difficult to explain structurally. I propose that the Fu Xi (aka Earlier Heaven) and Lo Shu (later heaven) circular arrangements are key to understanding the King Wen pairing scheme. The Fu Xi arrangement is known as the "primal" sequence. The circular diagram can be used as the basis for grid (example). The resulting eight-by-eight chart orders the hexagrams according to their binary values. Within that 8x8 grid, I drew a simple line between each set of pairs, i.e., 1 to 2, 3 to 4, 5 to 6, etc. The result is shown below (rotated 45 degrees to highlight its symmetry). The colors in this figure were chosen to highlight the extraordinary vertical and horizontal symmetry of the diagram. The red lines are perpendicular, blue lines are at acute or obtuse angles, and the yellow indicates overlapping lines. The same illustration with the upper (hexes 1-30) and lower canons (31-64) in red and blue respectively. This illustration may go to the ordering of the hexagram pairs in King Wen. There is a broken symmetry between the upper and lower canons. 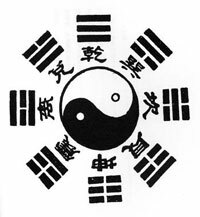 The upper and lower canons are symmetrical to each other, except for following hexagram pairs, which break the quadrant symmetry: 23-24 (Mountain, Earth and Thunder); 47-48 (Lake, Water, Wind); 49-50 (trigrams Lake, Fire and Wind). The pairs 7-8 and 13-14 (Water and Earth, Heaven and Fire) break the upper-lower symmetry across the horizontal axis. They are symmetrical to each other. There are also pair sets that break overall symmetry, but not visibly, because they overlap perpendicular lines on the chart above. These include 21-22 (Fire, Thunder, Mountain); 51-52 (Thunder and Mountain), 57-58 (Wind and Lake), 31-32 and 41-42 (Lake, Mountain, Thunder, Wind). In total, four hexagram pairs from the upper canon break symmetry, and six from the lower canon. The lower canon contains four more hexagrams than the upper. If one places the symmetry-breaking pairs in their own category, one is left with two canons of 22 hexagram, and a "special" canon of 20. The hexagram pairs featuring doubled symmetrical trigrams (1-2, Heaven and Earth; 29-30, Water and Fire) are symmetrical on the diagram. The hexagram pairs featuring doubled asymmetrical trigrams (51-52, Thunder and Mountain; 57-58, Wind and Lake) are asymmetrical on the diagram. There are also four pairs which visually break the symmetrical logic of the arrangement in terms of upper and lower canons without accounting for directionality -- 3-4, 21-22, 35-36 and 51-52. These are highlighted in yellow below. The outer arrows are of particular interest in terms of directionality. Highlighted below (in indigo and yellow) are two sets of arrows where symmetry breaks occur in terms of the direction of the arrows. The arrows originating with strong yang hexagrams (1 and 11) have a direction that projects from the hexagram location, consistent with yang properties. The yin arrows, interestingly, do not simply reverse this polarity. In the yin arrows for hexagrams 2 and 12, the direction of the arrows shows that yin is a step along the path rather than being the destination of the path. Yin receives according to its traditional properties, but it also releases -- it is transient. This always-projecting vs. step-on-the-path structure may reflect (or account for) the prioritization of yang over yin on the basis of yang being eternal (celestial) and yin being transient, or "weak" in Taoist philosophy and other yin-yang based schemes. The upper and lower canons are shown separately below. The upper skews to the left, and the lower skews to the right. There is no immediately discernable structual or systemic pattern to the ordering within each pair (i.e., why 1-2 instead of 2-1). There are narrative solutions, but the i-Ching inherently lends itself to narrative interpretation, so it's probably best not to read too much into this. However, it's worth noting that the diagram appears to reflect a mostly even, almost crystalline, balance of yin and yang.